On Saturday afternoon, as I was passing a nearby outdoor cafe, I saw a inviting plate of fresh tagliatelle with peas. It looked so good that I thought I would make something like that for dinner. As I began to think of peas, however, my mind turned to a childhood dish of those little green gems simmered with sautéed onions and pancetta. 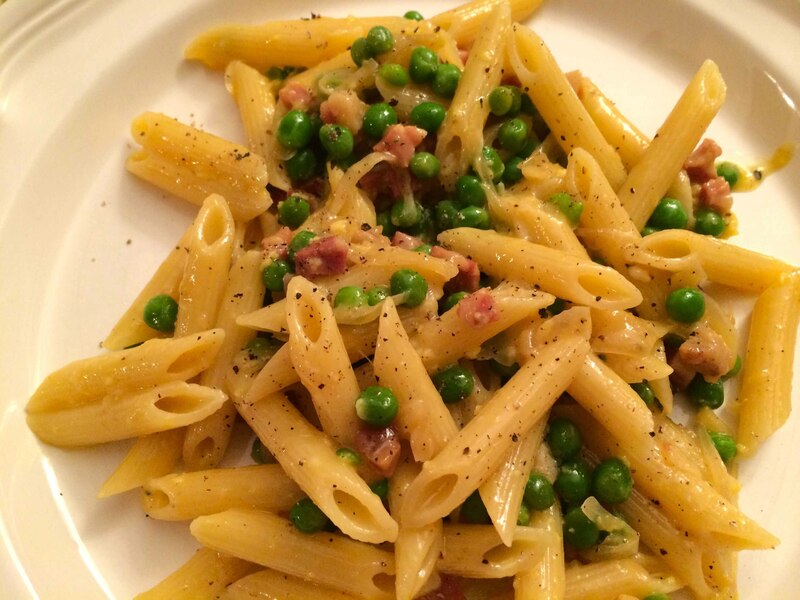 But then, the thought of savory pancetta brought to mind pasta alla carbonara. By the time I got home, I decided to attempt a fusion of the two dishes for supper. Bring a a large pot of water to a boil for the pasta; for 8 oz of penne, I use a 4qt pot. Chop the pancetta into small dice. In a 3qt sauté pan or Dutch over medium heat, heat the oil. Add the pancetta and let it render its fat; then add the thinly sliced onion and cook until the onion is soft and the pancetta is lightly crisp. Add the defrosted peas and cook for an additional couple of minutes until the peas are heated through. Remove from the heat and let the pan cool for a few minutes. Meanwhile, when the water has reached a full boil, add a small handful of salt. Add the salt slowly so that pot does not boil over. When the water has returned to a boil, add the pasta and stir. Cook uncovered until just before al dente. While the peas are heating, beat the eggs well with the cheese, a pinch of salt, and a generous grinding of black pepper. Reserve a cup of the pasta water. Right before the pasta is cooked to a nice al dente stage, pour the beaten eggs into the sauté pan and stir with the pancetta, onions, and peas. The pan must still be warm enough to heat the egg mixture but not so hot that the eggs will scramble. Immediately drain the pasta and add it to the sauté pan tossing it with the sauce to coat. If the sauce is too thick, add a tablespoon or so of water to loosen. Cover the pan and let it stand for about a minute. Serve with additional cheese and black pepper. The difficult part of this recipe is the timing. As I said before, the sauté pan with the pancetta, onions, and peas cannot be too hot or else the egg mixture will scramble when it is added. On the other hand, it should be just warm enough to heat the egg mixture so that it will coat the pasta. It’s also important to add the pasta while it is still hot so that its heat will help heat the egg mixture as well. I could definitely eat this right now.